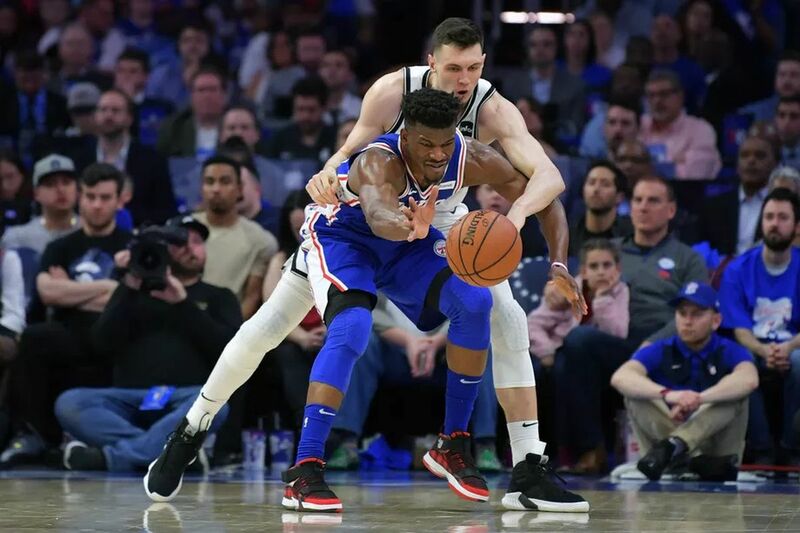 The Sixers dunked the city of Philadelphia in a pool of relaxing eucalyptus oil tonight, as they routed the Nets 145-123. We can all take a deep breathe... and exhale. It was exactly the sort of throttling Brett Brown’s crew needed to put on display. Just how comfortable of a win was it? Well, the Sixers ran a lineup of TJ McConnell, Jonathon Simmons, Furkan Korkmaz, Jonah Bolden and Greg Monroe to close out the game. That’s how comfortable. The first half was sort of disheartening for Sixers fans. Despite a seemingly more prepared Philly team, Brooklyn was making it rain from behind the arc, hitting 10 threes through the first 24 minutes. The Sixers went into the locker room holding just a one-point lead. And then as the 3rd quarter began, the flood gates opened. The Sixers racked up 51 points in the 3rd — their highest scoring quarter of the entire season. The final tally of 145 points was a franchise record for a single game in the playoffs. Perhaps the most important angle of tonight’s game was the aggressiveness with which Ben Simmons played. Simmons looked to get to the rim early and often, finishing 8 for 11 from the floor on his way to 18 points. Ben rounded out his line with a triple-double, tagging on 10 rebounds and 12 assists. It was a direct response to a miserable previous 48 hours, and even the strongest Simmons skeptics have to give credit where credit is due. Another encouraging sign was Tobias Harris’ performance. He wasn’t perfect, but he appeared to have some synergy within the offense after being a no-show in Game 1. His scoring touch hasn’t fully returned, but Tobi went 2 for 4 from deep, possibly working his way out of what’s been a dreadful three-point slump since the All-Star break. Harris finished with 19 points and was a perfect 7 for 7 from the charity stripe. Game 2 was a team win — no Joel Embiid or Jimmy Butler heroics, no grinding it out, just a solid effort all-around. As a team, the Sixers shot 38% from deep and 83% from the line, which was a huge improvement over their Game 1 percentages. The Sixers height advantage was evident as Brooklyn lost the rebounding battle by 19 boards. The 1-1 series heads to Brooklyn Thursday for Game 3 as the Sixers will look to take their first lead in the best-of-seven. Jonah Bolden got some minutes at the four early on in the game. Boban Marjanovic was very productive in 18 minutes of play, totaling 16 points on an efficient 8 for 14 and 8 rebounds. However, he clearly struggles on defense at times due to a lack of mobility. It makes one question his potential effectiveness deeper in the playoffs. In any case, we love you Bobi. Mike Scott provided a spark off the bench with 15 points, connecting on 3 triples on 5 attempts. I missed much of the first 2.5 quarters due to some personal stuff, and was a bit distracted the rest of the way. My apologies if I missed any important points. Sean Kennedy will be bringing you the Bell Ringer to cap off the night, so stay tuned. Mike Scott’s Game-Winner Propels Sixers to Game 4 Win The Sixers come back in the fourth to take a 3-1 series lead.